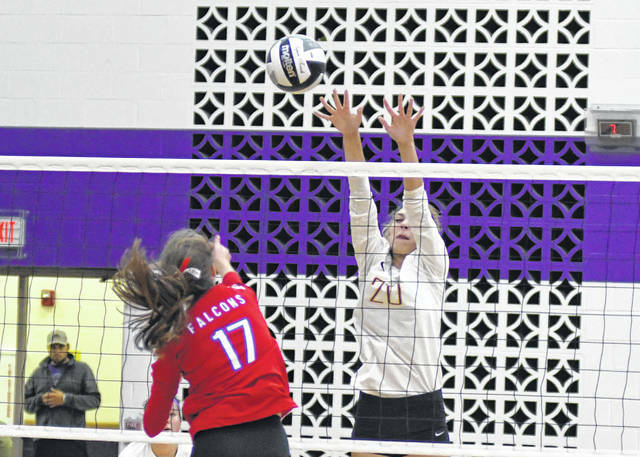 Eaton’s Kayleigh Michael dives for a ball during the Eagles match with Clinton-Massie on Monday, Sept. 10. Eaton outlasted the Falcons in five sets, 25-23, 23-25, 25-17, 17-25, 15-5. 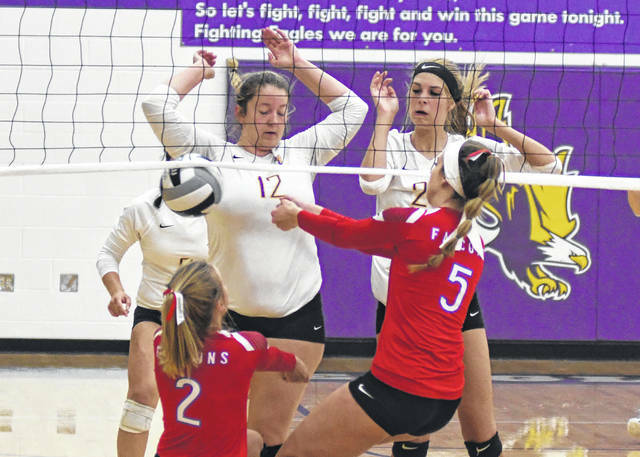 Eaton’s Becca Mowen (12) and Ava Miller go for a block during the Eagles match with Clinton-Massie on Monday, Sept. 10. Eaton outlasted the Falcons in five sets, 25-23, 23-25, 25-17, 17-25, 15-5. 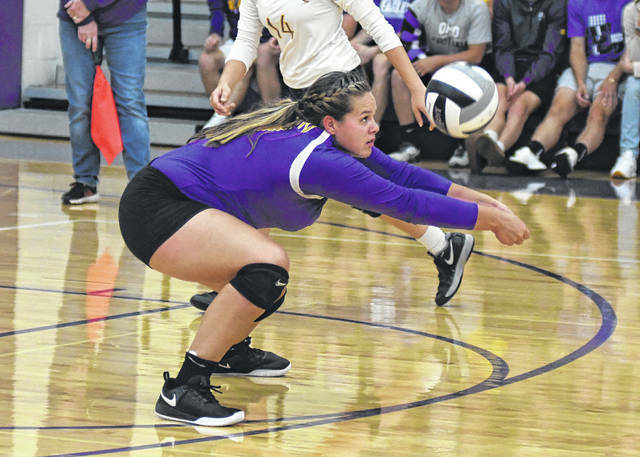 EATON — Eaton’s volleyball team extended its winning streak to five after knocking off Clinton-Massie, Preble Shawnee and Brookville last week. Eaton opened the week on Monday, Sept. 10, by outlasting previously unbeaten Clinton-Massie in five sets 25-23, 23-25, 25-17, 17-25, 15-5. Shaylen Perry and Ava Miller led the offense with 12 and 11 kills each. Becca Mowen added nine. 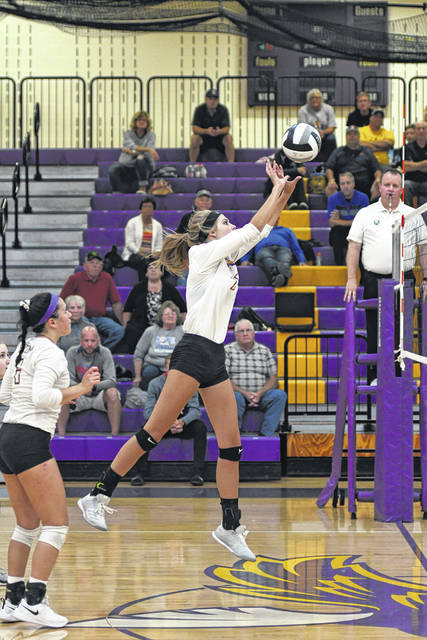 Courtney Giffen chipped in eight to go along with eight digs and Kylee Pitsinger added six kills. 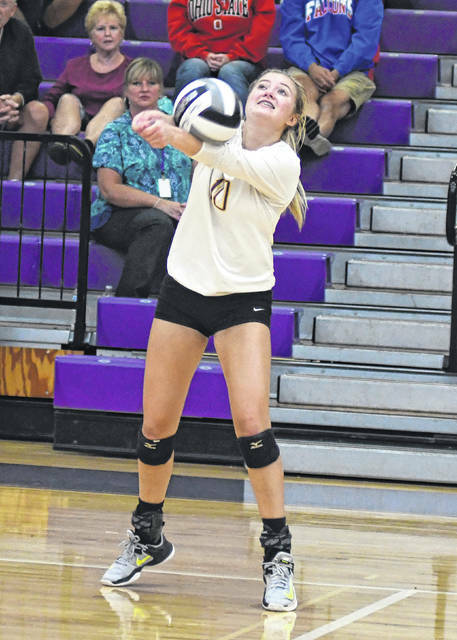 Maley Tinstman had 39 assists, 12 digs, and four aces. Annika Gels had 21 digs. 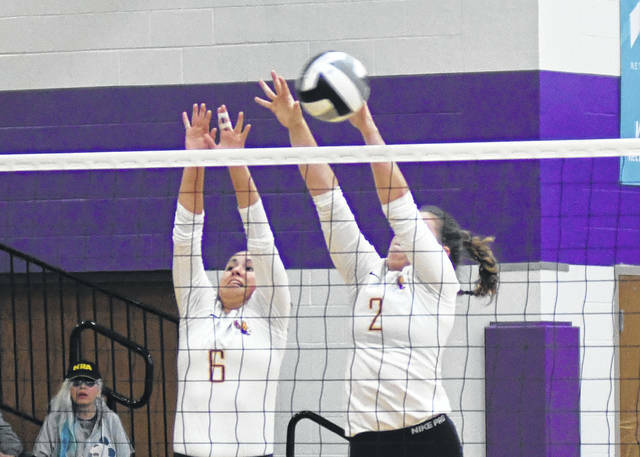 Kayleigh Michael and Alysa Sorrell had eight and six digs each. 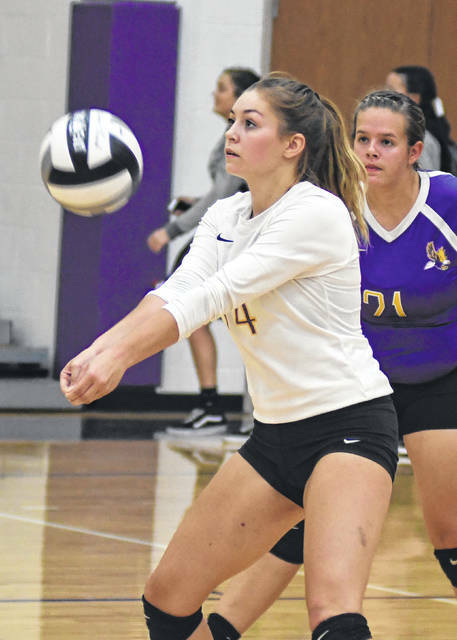 On Tuesday, the Eagles traveled to county rival Preble Shawnee and came away with a 25-8, 25-17, 26-24 win. “We always look for a challenge from Shawnee. They have a really strong coaching staff and they a have the Campbell kid, who can block and terminate. 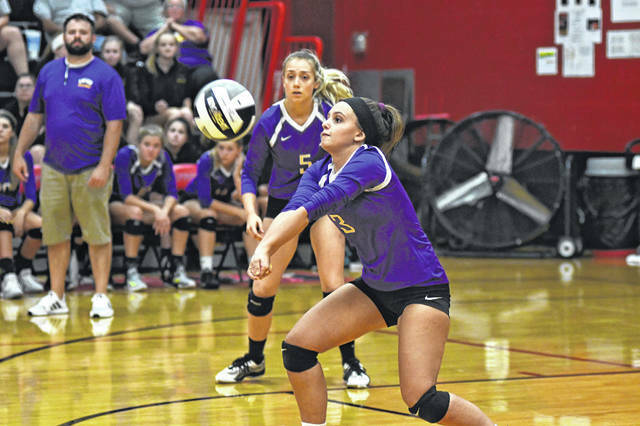 Our kids were mentally ready for the challenge at Shawnee, and it was a great opportunity to get everyone some court time,” Fields said. 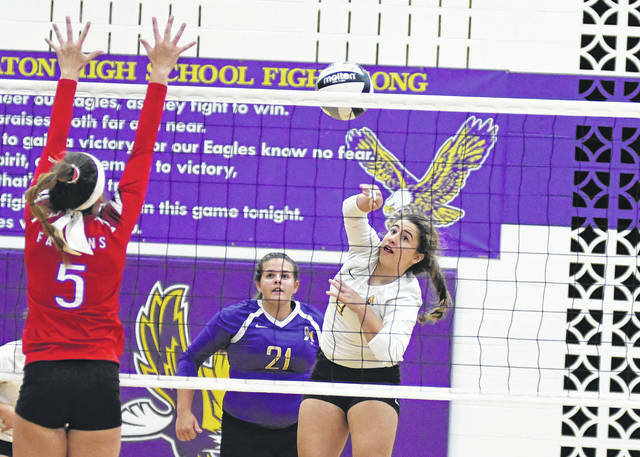 Pitsinger led the Eagles with nine kills, while Mowen added seven. 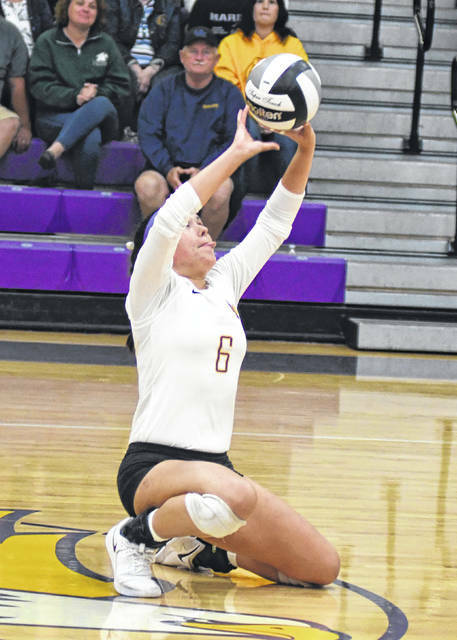 Tinstman had 11 assists, nine digs and three aces. Gels added 11 digs. 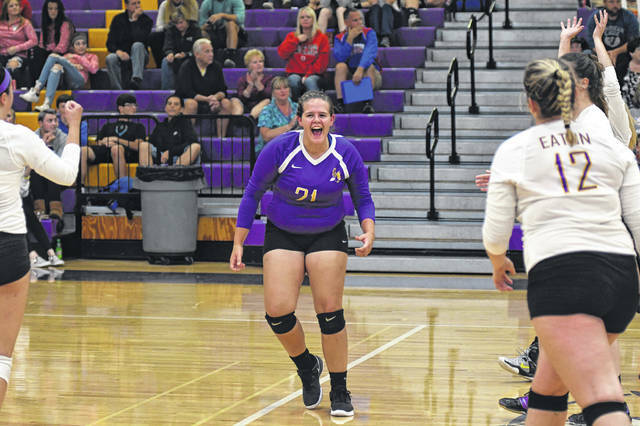 Eaton closed out the week by handing Brookville its second loss in league play and just second on the season, 26-24, 25-16, 25-21. The Eagles used a balanced offense to improve to 8-2 overall and 4-2 in the Southwestern Buckeye League’s Southwestern Division. Giffen paced the team with 10 kills, five digs and a pair of aces. 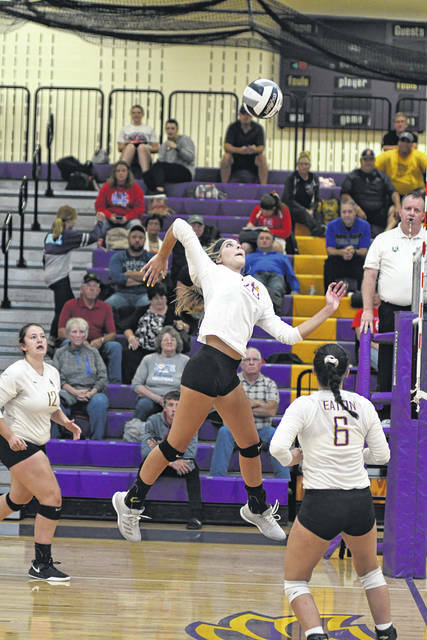 Perry had eight kills and three blocks. 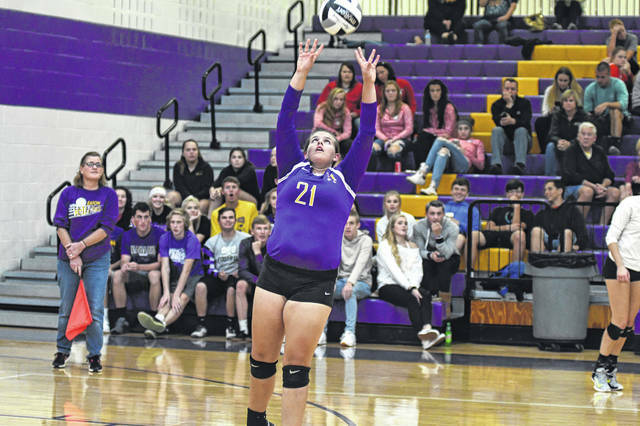 Mowen contributed seven kills, seven digs, three aces and two blocks. Pitsinger added five kills. Tinstman handed out 24 assists and added seven digs and three aces. Michael had 11 digs and three aces. Gels added eight digs and three assist, while Libby Giffen has six aces. “We are really happy with the way we have been passing the ball. Our service game has been really strong. I think that if we take all facets of the game and put them together, we can really start doing some damage going down the stretch. Great week, full of good team wins,” Fields said. Eaton was scheduled to host Twin Valley South on Monday, Sept. 17 then travel to league-leader Bellbrook on Tuesday. The Eagles will close out the week with a trip to Franklin on Thursday. 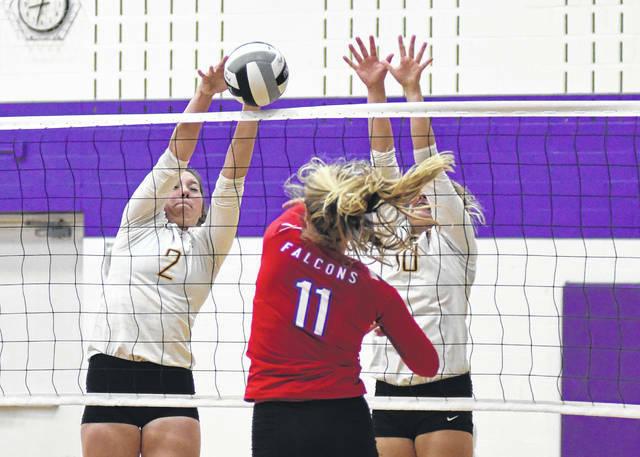 https://www.registerherald.com/wp-content/uploads/sites/41/2018/09/web1_ehsvb4-1.jpgEaton’s Kayleigh Michael dives for a ball during the Eagles match with Clinton-Massie on Monday, Sept. 10. 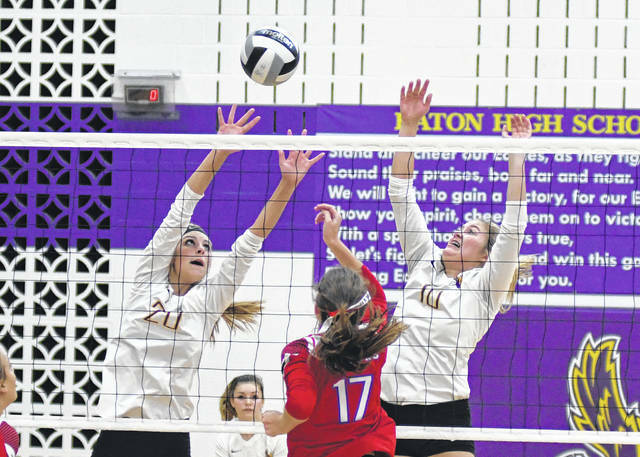 Eaton outlasted the Falcons in five sets, 25-23, 23-25, 25-17, 17-25, 15-5.
https://www.registerherald.com/wp-content/uploads/sites/41/2018/09/web1_ehsvb10-1.jpgEaton’s Becca Mowen (12) and Ava Miller go for a block during the Eagles match with Clinton-Massie on Monday, Sept. 10. Eaton outlasted the Falcons in five sets, 25-23, 23-25, 25-17, 17-25, 15-5.